A 30-second viral video shows a unique “fore-edge” book that was made more than 90 years ago. A woman named Miss C.B. Currie painted the book, a copy of Rudyard Kipling’s “Kim,” in 1925. She painted around 175 fore-edge painted books. “This particular book, which is signed by Currie, is unique in that it contains a laid-in photo of the scene depicted in the fore-edge painting,” read a statement from the Cornell University Library’s Rare Books Collection last week. 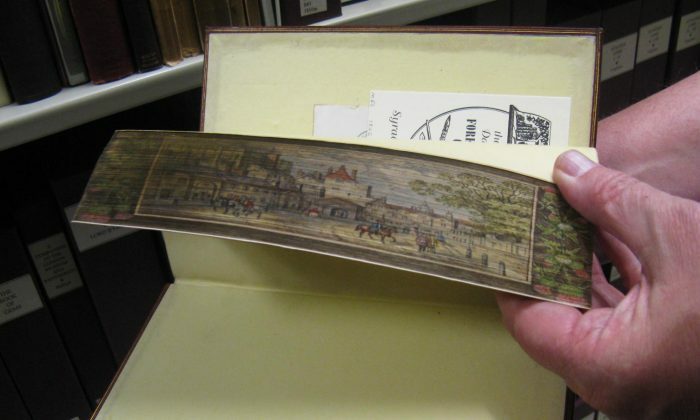 Fore-edge paintings arose in the 18th century, according to Indiana University at Bloomington. “The popularity of fore-edge paintings first arose in the late 18th century in the shop owned by Edwards of Halifax, who was already known for his exquisite bindings and who, by adding a fore-edge painting to an already fine binding, was creating the ultimate luxury item. Many other artists took up their paintbrushes to do the same,” the university states on its website. The earliest fore-edge paintings date back to around the 10th century, and the earliest signed and dated fore-edge book dates to 1653, which is a family coat of arms painted on a Bible. “Of course, the art of fore-edge painting goes back many centuries before Edwards, to when it was common to write an author’s name or book title onto the fore-edge of a book for identification purposes, but this exhibition (with one exception) focuses on the heyday of the “vanishing” fore-edge painting (one that is invisible when a book is closed and appears only when the book is fanned open) that began in Edwards’ shop and continued into the 20th century,” Indiana University adds.